With Awesomenauts Settings Manager (from here on referred to simply as ASM) entering its open period (read: custom games are supported and asking for access should be less of a pain), I think this warrants that the newbies get someone to explain to them what tool exactly they're tinkering with, hm? I don't claim myself to be the most skilled or professional ASM user, but I do think that whatever knowledge I can share should be enough to get you started in the world of Awesomenauts modding. Before we can even start modding, you must first acquire the ASM client. For safety purposes it's only available to the members of the ASM Beta Testers Steam group, where you can also report bugs, suggestion new features and discuss your modding adventures. Once you've been invited to the group, the download link to ASM can be found in the [DOWNLOAD] ASM Beta [version] thread. ASM updates come out rather irregularly but recently they have been a lot of them, so be sure to check the thread regularly for new updates! As of version 0.4.6, ASM is only available for Windows, but Mac/Linux releases may appear in the future. Once you have found and downloaded the program (there's no specific folder that the ASM executable has to be put into), you will need to register yourself - the registration is very quick and it's only (to my knowledge) used for the purpose of the Mod Browser function (more about that later). You only need to register once to make use of ASM. Once you have registered and logged in, this is what your screen should look like (more or less, anyway). 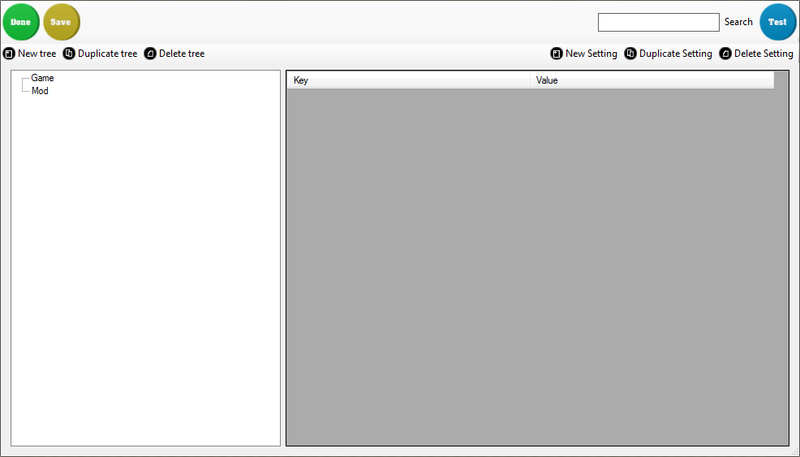 Extended Modding - contains additional modding tools such as Map Editor (as of the time not yet available), Localization Files Editor, File Exporter and ability to change the game maps to custom-made ones (irrelevant until the Map Editor comes out). Launch Awesomenauts - launches the game (the path can be specified in the config) with whatever mods are currently enabled (you can also launch the game from Steam and the mods will load normally). Hitting the tiny arrow next to it allows you to launch the game without mods. So let's say you want to make a new mod now. 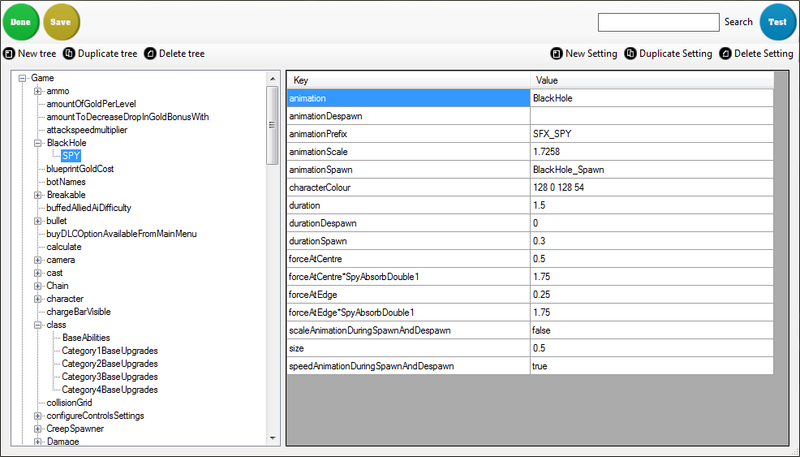 Before we can start doing that though, we first have to acquire the game settings - that huge list of various lines of code which determine all in-game behaviors that can be later edited with ASM. To do that, click New Mod and name it whatever you like. This is the window that should pop up now. Right now it may seem very confusing, and more importantly, very empty (as we only have two empty root nodes, Game and Mod). We have to change that. How? While having ASM open, launch Awesomenauts (either via ASM or Steam) and let the game load. Once you're in main menu, you can close the game (though it's not entirely necessary). Now if you look at our ASM window again, you can see that the "Game" root node now has a + next to it, and expanding it will reveal a huge list of trees (nodes). Each of those nodes can link to more nodes (subtrees, if you will), and each node contains certain settings which correspond to a particular aspect of the game. 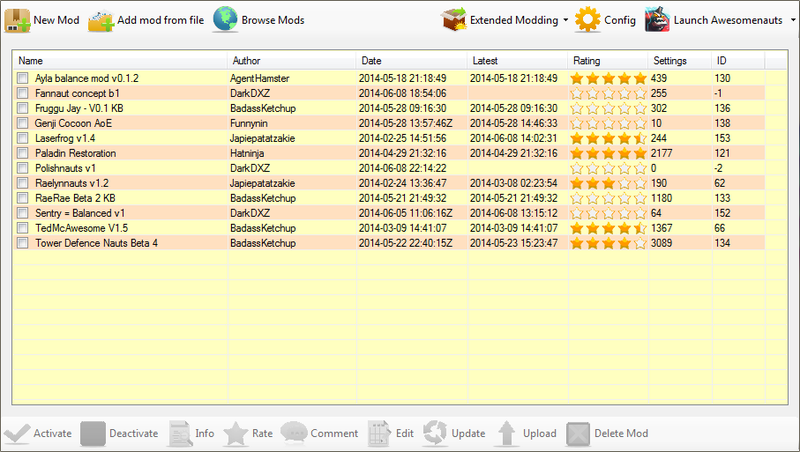 Save - saves your current mod. Use this often! Delete Setting - clears (in case of default settings) or removes (in case of new/duplicated settings) the chosen setting. Note that simply clearing the value of a stock setting will cause a bug - use this option if you want to disable a certain setting. Okay, we have everything set up, we can finally start doing something meaningful! Let's start with something really simple - making Lonestar shoot Derpl's Nukes with his blaster. First, we have to keep one thing in mind - within the game code, 'Nauts don't use their actual names but rather their internal names. Same applies to most in-game upgrades and skills. Within the ASM group you can find a full list of who is what in-game, but for now the two relevant names are Cowboy (Lonestar) and Heavy (Derpl). Now, let us look for settings related to Lonestar's blaster - to do that, we have to go to the tree called shoot, and find a subtree called CowboyShot (which refers to Lonestar's auto-attack). Clicking the CowboyShot tree will bring up a list of settings on the right. Here we can give Lonestar an ammunition system, change his auto-attack speed (cooldown), make it only available under specific conditions etc. What is important to us is to find the setting that determines what exactly is being fired using this shoot. To do that we have to find the bulletSettings setting (which will then call for a specified subtree in the tree called bullet) - it should also say CowboyShot (but then it will be bulletCowboyShot rather than shootCowboyShot, which is where we're at right now). Now, we can do two things here - we can either make Lonestar shoot the exact same Nukes Derpl does, and that can be done by simply replacing CowboyShot in the bulletSettings with HeavyNuke (which is Derpl's Nuke bullet). Saving the mod, hitting the Test button and going into a private/custom game as Lonestar will show that hitting the AA button will now spawn a huge Nuke from Lonestar's hand rather than the usual tiny pea bullet. Getting into a fight will show that it does actually deal Nuke's 50 AoE damage. Congratulations, you have just made your very first mod! And made Lonestar the most overpowered 'Naut in history, but all in the name of science! But why stop there? What if we want to customize our Nukestar? What if we want to make the Nukes similar, but different from Derpl's Nukes, without changing the actual Derpl's ability? To do that, we will have to make a new subtree in the bullet tree for our Nukestar to use. Look for HeavyNuke bullet, duplicate the tree (with the Duplicate tree button) and change its name to CowboyNuke (it can be anything, though). You will also have to change the bulletSettings under CowboyShot to CowboyNuke. What is relevant to us however is changing what damage (and other on-hit effects) values the Nuke will apply to the targets on hit. Since Nuke deals AoE (and not on-contact like normal shots) damage, look for the setting areaOfEffectDamageSettings and change its value to CowboyNuke. You can also change the actual damage AoE. (for future reference, 0.1 is Gnaw's collision width) It will however make the actual graphic and the damage area go out of sync, so let's not touch that for now. Now go to damage, find HeavyNuke and duplicate it again, changing its name to CowboyNuke. Go to the newly-duplicated tree and take a look at some of the settings. We can change the actual damage value (making it negative will turn the damage into a heal), add a damage bonus against 'Nauts (which can also be negative, resulting in lowered damage against Nauts or even making it a heal). We can also add damage over time, various CC effects and upgrades (more about upgrades later, these are very important in higher-end modding). To keep it simple, let's make it deal 15 damage (damage = 15), slow by 15% for 2s (slowFactor = 0.85, slowDuration = 2) and deal 25% damage against turrets (damageMultiplierAgainstTurrets = 0.25). Hit Save, hit Test, pick Lonestar and enjoy your slowing AoE nuke that deals negligible turret damage! Now, this is only the tip of the iceberg. You can change many more things with modding - the most amazing example of what can be done with ASM is the Tower Defense 'Nauts mod by Badass Ketchup, which you can read about here. You can also download the test mod I talked about in this tutorial on the Mod Browser, under the name of Tutorial Mod: Nukestar. You can play around with it, add upon it, do whatever you wish with it. This tutorial covers merely a fraction of ASM modding, but should be enough to kickstart aspiring modders into the world of Awesomenauts Settings Manager. If you have any questions, suggetions or maybe want a tutorial on a more specific subject, let me know! Last edited by DarkDXZ on Thu Jul 03, 2014 1:10 pm, edited 1 time in total. Bamp cause i just noticed this and it seems really nice. Also i was wondering, to get invited to the group do i add you on steam or should i request an invite in some other way? Just add me/someone else mentioned in the OP on Steam, tell me you want an invite and I'll send you one. Alright, cool. Im alien vendor. Question: Where do i find cooldowns/attackspeeds? Cant seem to find them. They're under the appropriate skill's shoot (for ranged attacks) or hit (melee attacks) subtree, and the setting is simply called "cooldown". shoot -> CowboyGrenade -> cooldown. hit -> VampireBite -> cooldown. Each setting under "class" seems to decide what abilities and character the id specified will spawn. Each one starts and ends with a special value. The first decides what upgrades the class will use, defined in class's trees, and what value it uses for the game (e.g. MaxSpeed@Cowboy). The second decides what character the class will spawn. Between the two special values, you bind various actions to buttons. Without any, the class will do nothing. Actions include trees like: walk, jump, skill, shoot, hit and cast. Some can have an icon with them that will appear in the skilldock from their respective button. NONE - Not a button, it triggers automatically. ABT_FACE_LEFT - Left Click with the mouse. ABT_FACE_RIGHT - Right Click with the mouse, or "Q"
ABT_FACE_TOP - Middle Click with the mouse, or "E"
ABT_FACE_BOTTOM - "W" or Space. Oh god, thanks so much for this guide! I was trying to do something into ASM but couldn't do anything right from the get go hehe. Unfortunately, "the game engine doesn't allow that" (understand, "any flash game on the internet can do something that simple, but they're too lazy to implement it").